On the way to Mumbai yesterday, it rained. 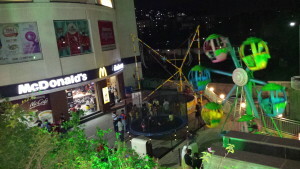 My middle daughter cried fora long time because we could not see monkeys in Lonavala. During our last trip, a few weeks ago, we had stopped and fed the monkeys in this little hill town, little paper cups of steamed corn spiced with red chili powder. On a side, way below- railways tracks crisscrossing in and out of a tunnel, on another side water falls and cliffs. On that day, the skies were covered with mists and the monkeys lined the highway, babies hanging off their mother’s backs and bellies. The girls have grown up in America. They stop to admire goats, cows, sheep grazing on patches of grass; camels, dogs and cats searching for shade on hot days. Monkeys are a whole special breed. Rarer and therefore more precious. Recently, I heard of monkeys outside their classrooms and they are absolutely thrilled by their presence in their school. 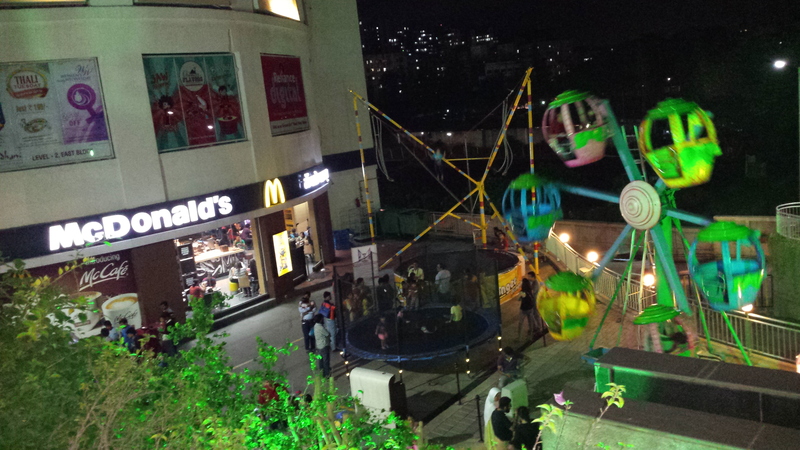 So why should my daughter cry because she did not see monkeys in Lonavala? She slept the entire way to Mumbai after that let down. Later she said, “This drive was not as fun as last time.” She wanted everything to be exactly the same. This trip had to replicate the last one because that was so much fun. And I have been thinking about myself and how somewhere I am reaching for that myself. “That time” in life when I was young and full of hope- am I constantly trying to replicate “that time” and struggling with the sceneries that are no longer the same, the fact that the monkeys are now not sitting on the highways? Is this why we are here in India and if that is so there is no doubt in my mind that it can only lead to being disappointed? “That time” when I was young, when I worked as a news director in a twenty four hour news channel, that time before bad marriages, before disillusionments, before child-birth tore the body in irreparable ways, that time before I found I was not enough on my own in foreign lands, that time before I let a man convince me that I was nothing. Between that time and now, a river has flown, mountains have formed, craters, ridges, gorges, hills- the landscape has changed and shifted. So have I.
I take a deep breath and settle into my chair as I write this. The family has settled in. I feel like the surveyor of a new land waiting for a discovery. Every year for my birthday, my husband and I buy a piece of jewelry for me. Gold, Indian gold, that glitters brightly in every light. I am a mother to three girls and I am collecting. I am gathering to me pieces of gold and gem to pass on to them. “This was when I was thirty six. We bought it in Pondicherry. This we got the year your youngest sister was born. It was a special year. This for you and this is for you and this for you.” I imagine myself telling this to my girls when they are young women and ready to start their lives on their own or with someone they love. Indian families give gold to their daughters and daughters in law. It is a tradition of passing on something of value that can be used in time of need, for girls who were traditionally married off into families, where they had very little voice of their own. When my first marriage had failed, I had given it all back to the man I had married. I had a bright colored pouch, a mini handbag full of gold. Earrings, necklaces, rings, lockets wrapped around each other in love. The man I had married asked me, “Where is the gold?” “Here.” I had said and given it to him before walking out of his home and life. It was such a relief. We spotted her outside the car windows. Her face was painted like that of a clown but the lines around her eyes and mouth were so jagged that it made her look lopsided and a little absurd in an innocent way. She looked no more than seven or eight years old. Seeing us looking at her she began to turn cartwheels. 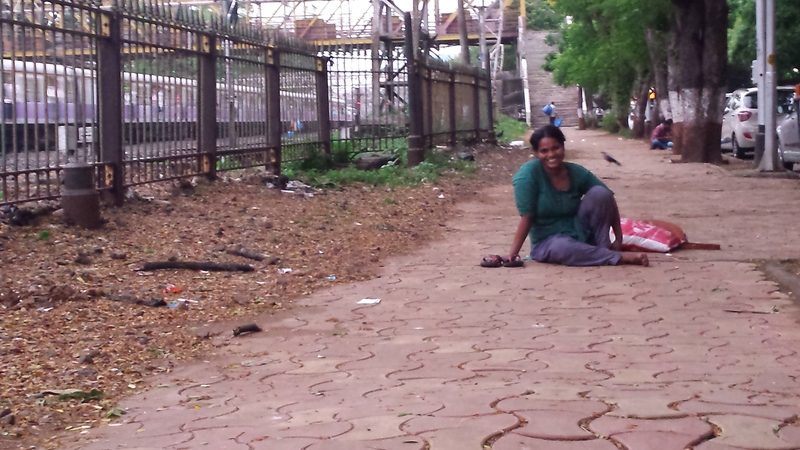 Her feet rose up amidst the cars and then she appeared upright and smiling, making eye contact with us. A couple of cartwheels later, she stood outside the window twisting her arms around her in a form of such supple gymnastics that we all stared at her and simultaneously reached for our bags to find something to give. I pulled out a hundred rupee, did a quick dollar conversion in my head and wanted to give it. Everyone in the car stopped me and I put it away. My brother opened the window and gave her a smaller rupee note. Then suddenly our car was surrounded. Many children with their faces colored in those garish hues, round blackened eyes, bright red lips, hair in bright ribbons; smiles painted on. They started to beat on the windows. Rhythmic hits on the glass, palms beating relentlessly with the strength they had displayed in their aerobatics. Suddenly their faces formidable apparitions from a psychedelic dream. Hands, faces, colors, forces, threats of violence and danger. Children become monsters. The car began to move. I expected them to give chase but they melted away in the smoke and dust of the moving cars. 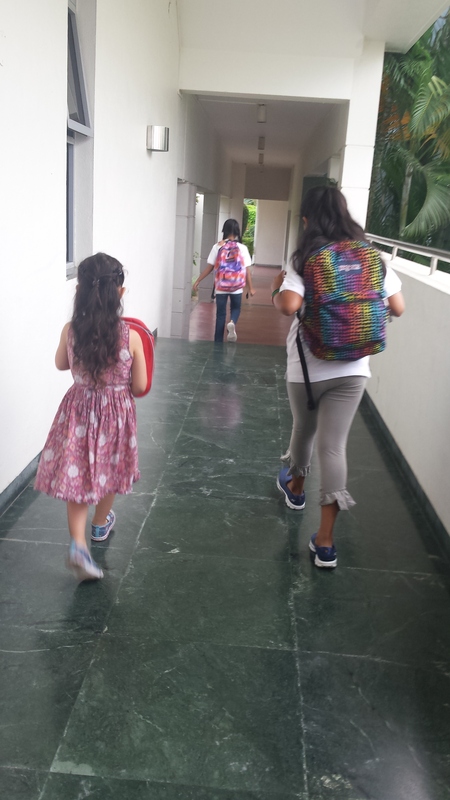 The girls have started school. They hug and then they run off, sometimes they come back for a second hug. One of the teachers told me,”We prefer if the parents don’t linger.”So Tom and I don’t or try not to. It is hard. In Berkeley, at the same school for 5 years, we lingered and not just we, many parents. Many congregated on the sidewalk, some in the coffee shop near by. At the international school here, most kids take the bus. Those who come with their parents, walk into the school alone and do not seem the worse off for it. “Helicopter parents.” My husband once told me. “We are hovering around our children all the time trying to facilitate their lives by making sure they have enough friends, are in the classes with teachers we like and cross every obstacle on their behalf if we can.” I didn’t know other ways to be their parent. Those who were on the other side of the spectrum, busy with their own carriers, hands off about what their children ate or what their children did after school seemed callous and uncaring to me. There must be a balance; I hope to find it here. Day four at the school. I am standing at a distance and watching the children. I do not want to be accused of “lingering.” I realize that my children are almost hard to pick out in a crowd. They are brown among brown. Do they revel in this freedom of anonymity? Does their skin sing in harmony with the brownness of the earth and of their friends? My oldest was four when she had painted her first picture of herself- brown skinned and dark haired in a classroom of what she called “peach skinned and golden hair”girls. At their school in Berkeley, our girls were poster girls for the diversity the school wished to project about itself. And yet, the girls were asked to remove their bangles. Every girl in India, young or old wears one on her wrist. I tried to explain this to their teachers but they were not impressed. “But what about understanding diversity?” I would often ask. Does sameness in color grant one a greater sense of belonging? I think it does. Divergent colors and backgrounds are not impediments for friendships or love but similar skin colors can be a facilitator in relationships. “An African-American thinks or realizes something about his or her color every thirty seconds.” I once heard this in a workshop in San Francisco. It is true that in America, I was often self conscious or proud of my difference, depending where I was that day. Never indifferent, never oblivious. I watch the girls play and hope they will revel in the sameness they share with this country and a culture. Whether it will help them make friendships, I do not know. For now, I hope they can forget for a while the color of their skin. Four years ago, my daughters started their schooling in a French school in Berkeley. Now, not only was I not just an “alien” (the official term used by UCSIS for immigrants) but also I was now a Francophone alias Indian alias non American alias non French-American alien. The first few days dropping and picking the children from school were spent in the normal haze of children whimpering and crying. Ishani, the oldest drew pictures of herself brown skinned and black haired in a room full of what she still calls “peach “skinned and blonde haired. When we were called for a parent teacher meeting for Asheema who was then not even three, I joked with my to be husband, “What will they tell us that she cannot draw within the lines?” We listened in disbelief as her teacher who had just come from France sat with the dean of students explaining how she was concerned about Asheema not running in a line, of the certain tilt to her head and yes, the inability to draw within the lines. We left the meeting shaking our heads in a tizzy of fear and worry about their futures. What I had never imagined had happened! Our three year old not being able to run in a straight line or draw within lines were indicators of a serious problem. Dropping the girls to school every morning I am caught in a more personal problem, the dilemma of not fitting in myself. The women around me whether French or American, difficult to discern from simply skin color or nose shape are all impeccably dressed. Their faces do not reveal any of the trials and tribulations of being a parent who is dropping a child to school at 8 am in the morning. Hairs and nails gleam, their perfect clothes drape their shapes in good taste. Some days I try to look like them but end up more like a mannequin at uncertain store front. You must have passed them by, these stores. They sort of have the right clothes but somehow something is wrong, it could be the accessories are clueless or the mannequin’s hair looks like an old man’s wig. In winter I am glad I can cover myself in a gigantic coat and sometimes I am still wearing my pyjamas under this coat at drop off. I am ashamed. But I am a woman of intellect I tell myself; I have numerous degrees in English and French literature. I will find women like me. I don’t find them not because they were not there but because they could not understand me. In the early days, I was so glad to finally be able to speak in French again that I spoke freely and often. “Can you speak more slowly?” A kindly mother with a French accent asked me in halting English. I tried English which I have spoken since my birth, I tried French which I spoke since I was twelve but my English and my French were too Indian for the lack of any other way to describe it. I looked longingly at moms in groups conversing in either of these languages. I never joined them. There were some Indians in the school, not many at that time. One of the women, a professor at UC Berkeley spoke Bengali. I was thrilled- a compatriot. Other than language, we had nothing in common. She oozed self-confidence, her accent more exotic than mine. As a full time faculty at the university, she also had no time. No time, don’t fit- it was one or the other for me. Meanwhile my older daughter continued to draw pictures of herself, brown and black almost a blotch or a blob in a peach skinned and golden universe and her younger sister continued to be a source of concern to her teacher. “You should get her ears checked. Maybe she has a problem with her balance.,” her teacher said. It amazes me now to recall how quietly I would acquiesce at everything. I got her ears checked. She was just fine, my pediatrician assured me. My daughters and I continued to float in bubbles of uncertainty. I was constantly plagued by my shame and inability to fit in and when I saw that reflected in my children’s struggles I took it is my own failure. 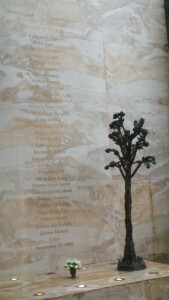 Thirty one people, guests and employees of the Taj Mahal Palace Mumbai, died on the twenty sixth of December 2008 during terrorist attacks that spanned coffee shops, another five star hotel, a railway station and a hospital. There is a plaque on a wall at the Taj that has a list of the casualties at the hotel. The last name is the name of the dog on duty that night, Lucy. A wall fountain with water flows next to the plaque, like washing away constantly the blood of that night. I mention that night gently in a few of my conversations with hotel staff. They are not allowed to speak about it. Yet some still do. 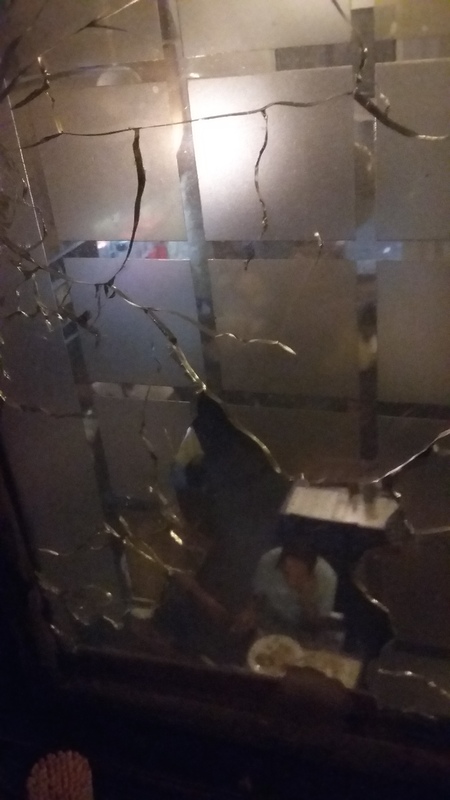 Unlike Leopold Cafe near by which was also attacked and which has maintained some of the bullet ridden windows, at the Taj there is no other sign of that night. The Harbor 1 Bar, the first bar in India, license number 001 was shattered too. It is not something that is mentioned when we have our drinks there one evening. We have a drink that is one of the most fantastical I have drunk. Stories of an American sailor who comes ashore in the early 1900s and asks for something special at this bar when he hears that prohibition had been lifted in America. The drink, a mix of fruit juices and alcohol set on fire at the table like a flambe´is magical, like a fire lit on evenings when lamps and lanterns must have adorned these walls. Yet I feel a certain pathos. I wish there was a drink that remembering the lives of those who died that night. I hear that. Human curiosity is merciless. Another employee tells me sadly that many of his friends, chefs in the main restaurant that night, died. I look around me at the polished surfaces, the gleaming chandeliers, the views of the sea and the Gateway of India, I eat the best food I have eaten so far in this trip to India. I cannot but still feel that the sadness and senseless brutality of that night lingers beneath the glamor. It is a hotel I will go back to because of all of that. A couple of days ago, I slept the night on the living room sofa bed. I woke up in the morning, and, through the haze, before I wore my glasses, I saw what looked like a mouse. Indeed it was a mouse. A dead mouse. I stared at it in horror and then looked around me at the house. How had he come in? From where? Was he seeking shelter when he knew he was going to die? Had he been poisoned? Is this how this little series of bungalows in this gated community kept itself so clean? My husband picked it up in a tissue and put him at the base of a plant outside. In India, people believe strongly in signs. Don’t sneeze on your way out, do not eat eggs when you are about to write an exam, that bat that hangs outside your window on a tree, that black cat, that girl who talks too much or laughs too much, that dead mouse in the house… For the fearful, for the superstitious- life, the decisions made, the steps taken or not taken are guided and formed by the signs. That dead mouse, it came to my house to die two days ago. This evening before I sleep I mourn him. 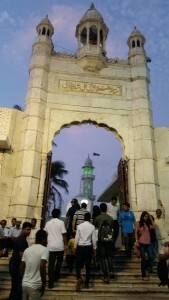 Mumbai was a city I secretly feared. I grew up in a small town. 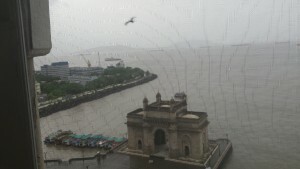 Mumbai, previously known as Bombay, was big, scary and glamorous; in my mind it was a city for mobsters and film stars and slums and crowded trains. I have never been to New York. 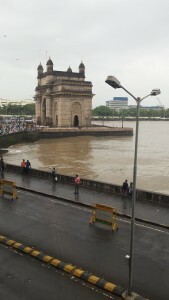 My impressions of it are the same as those I have held of Mumbai. We drove this week from Pune to Mumbai. I wondered what it was my children saw as I looked around me at this city. Mumbai has withstood many acts of terrorism. One against the very hotel in which we had booked a room. The view from our room was that of the Gateway of India, of a sea through which conquerors and traders had reached this country. Police security is visible everywhere- outside monuments, temples, malls, by the side of the beach. What I see is the common man who lives, strives, loves, works just as in any other place in the world, just perhaps the effort and strain a little harder. I go for walking tours, for bicycle tours. Sometimes I go with Tom, sometimes with the children and sometimes I am alone. It is ironic that it is so easy to be alone here and yet not to feel lonely. I visit a church and let the deep silence seep into my bones, I stand in silence outside the first synagogue of the city and perhaps in this country, I enter a temple with a special queue for non resident Indians. I sit by the Arabian sea listening to Sufi singers at the tomb of a famous Muslim saint. It rains almost all the time. The mud, the dirt, the human and animal excreta are washed away and then accumulate again. 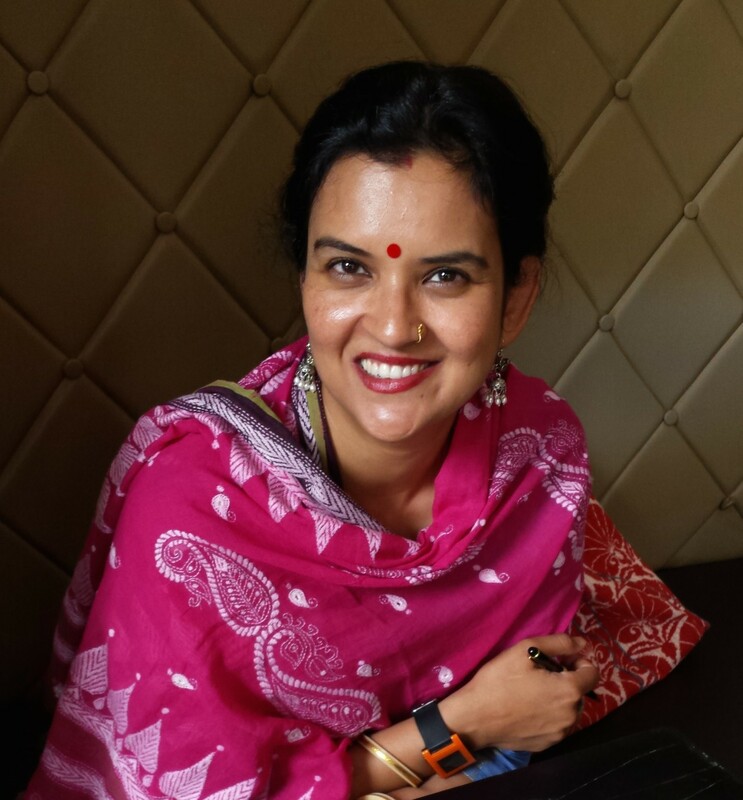 I meet a fellow writer who shares my outlook on the challenges of a woman’s life seeking her place in the world. She understands what I say and what I leave unsaid. 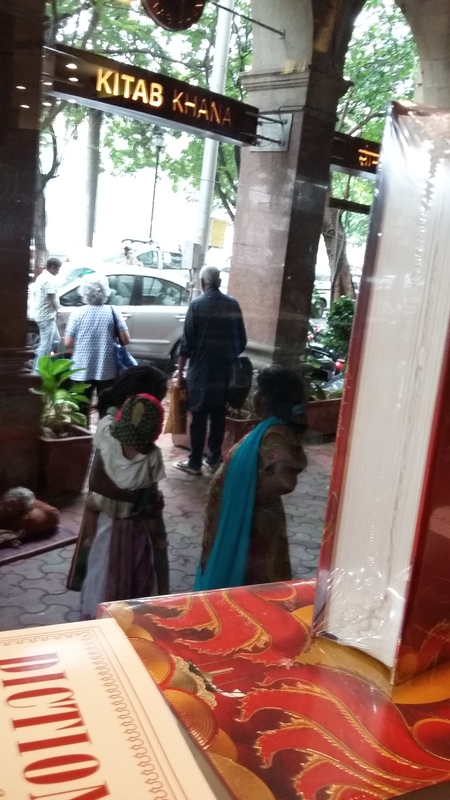 I go to the house of a Parsi lady, ninety three years old. She makes me feel as though I have known her my whole life. Her hospitality is simultaneously one of this world and one of graceful times left behind. She speaks simply, she speaks without guile. I go to the house of another fellow writer for dinner. She has read my work and she offers words of support, and again that ear and a heart that understands what I say and leave unsaid. I find in these women traces of myself. I find in them a circle that pulls me into their midst without judgement or reservation. America and the home I have made for more than a decade is half way across the world. What will we find here? The pilgrimages to homes and places of worship bring with it a melody to the solitudes and work of a woman. In Mumbai as in India, I find I am a stranger and yet at home. 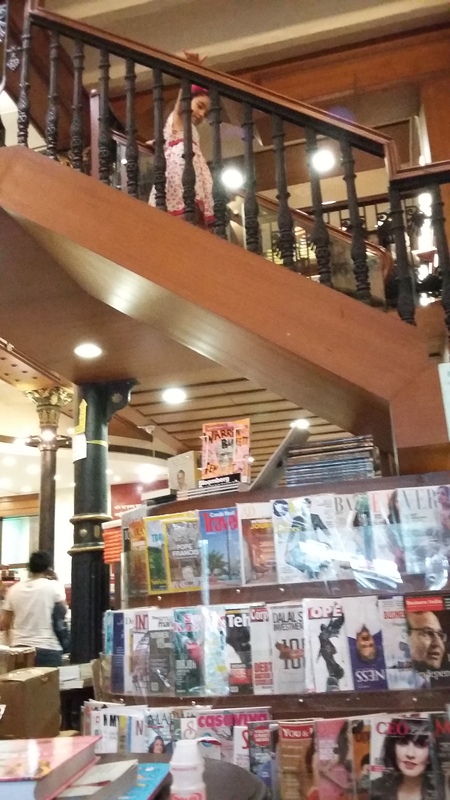 I am sitting in Kitab Khana in Mumbai, one of the rare remaining bookstores that does not belong to a giant chain. 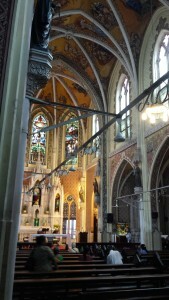 It feels like a heritage site- heavy wooden furniture, iron wrought beams, statues and art on the walls. I am sitting on one of the leather couches, legs folded under me and for a little while I let my fatigue overwhelm me. As parents of young children, it is a luxury to allow yourself to be tired and just stop to rest. A young lady, moderately pregnant, sat down on a chair near me. She wore diamonds in her ears and on her fingers and a big bag with the name of a famous brand printed on it. She ran her household from the bookstore. Chinese chicken fried rice and vegetable manchurian for lunch and paneer for dinner for her husband, light bulbs for the bathroom and a scheduled time for a driver to pick her up from the store. She did this all while leafing through Cosmopolitan and Vogue. An old man was seated to my other side. He had been reading a big thickish book. He looked up at me and our eyes met. “Today, not many people read books.” he said. He wore old fashioned horn rimmed glasses, his shirt and pants neatly pressed; he carried on him, in the neat parting of hair, in the slight stoop of his shoulders, an air of faded dignity. “We bring our children to libraries and book stores whenever we can.” I told him. “Good, good,” he said and then looking at the girls, he continued,”They are your assets.” “I hope they will be their own assets.” I quipped. He smiled and pointed to his book, “So many great lives..” I peeked at the cover. Sugar in Milk, Eminent Parsis. “Are you Parsi?” I asked. “Yes.” he replied and for a while he seemed lost, gazing into space. “You miss the old days?” I asked. “Yes,” he said “Look outside, look at those cars. Where are they going to go? Where are they going to park? The young today are carefree, they do not think for themselves or for the world they live in.” He got up slowly, tucked an umbrella and a newspaper under his arm and with a slight nod of his head to me, took his leave. I watched him walk out into the Mumbai rains and hoped he headed to a warm home. 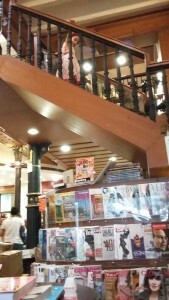 Bookstores can be resting places, they can be meeting places. By their very nature, a refuge at all stages of life. I hope they will still be around when I grow old. My daughter comes and asks me for a book on Vishnu, the Hindu deity. She is wearing a pair of shorts and an Indian tunic. “I am American inside and out.” she often tells me of herself. “Maybe, not so much.”I think to myself and smile as I get up to help her find her book. 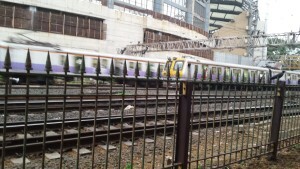 The trains are busy in Mumbai. Driving by one of the stations, I stopped to watch them pass by, criss crossing slowly through the tracks like the lazy meanderings of lovers on a Sunday afternoon. I was standing and watching them when she called out to me. She was sitting on the side walk, watching the trains too. “Madam, madam take a picture of me too please,” she said in perfect English. “Ok,” I replied and knelt down on the ground. Then she started to laugh and changed her poses a few times as I clicked. I was turning to leave when she called out to me again. “Can I talk to you please Madam?” “Only if you are not asking me for money,” I replied. 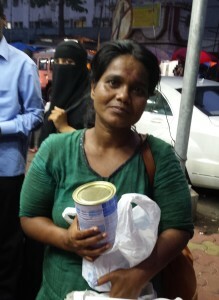 “I am not,” she said as she slowly got up and walked to me, “Not money, just a can of milk powder for my child.” “Hmm. ok,” I replied, “Where do we go for it?” She pointed vaguely to a side and said there was a medical store that way. I beckoned to her to walk with me but she said she would like to go in the car. “See, I have a limp.” Off we went. Outside the medical store, she pointed to the milk tins she wanted- the number 2 Lactogen. She held them close to her and turned to me and said, “You are a queen.” “I am nothing or we are all queens,” I murmured embarrassed before taking my leave. In India where Karma is the real ruler, the queen, the arbitrary decider of our joys and sufferings, life is almost easily accepted and explained. For both of us, this was a debt I owed from a past life.